I enjoy the digital modes, chatting with hams through the laptop. The transceiver is a Yaesu FT-991 and it can be controlled by a computer via USB or RS-232, ideal for digital modes. send information to an interactive propagation map for ham radio (PSKreporter) and use DXspots. Here is my comparison and information on some digital mode protocols (pdf, in Swedish), appeared in Swedish ham magazine QTC 1/2019.. Here you have digital HF station configuration help when using an FT-991, FLDIGI, WSJT-X, JTAlert-X and logger N3FJP AClog. The computer runs Windows 7. It is assumed you are a LoTW, eQSL and QRZ.com user. Several programs can't share a COM port for CAT rig control. Although it perhaps shouldn't it seem to work with a free (32-bit) VSPE Splitter. With the 32-bit version you get a free activation code. VSPE has also a nice function to see which programs that are connected to each Splitter (select one and click the blue i icon. If all your programs use OmniRig for CAT, there is no need for the COM port splitter, since OmniRig handles the COM port splitting - I wish all Windows radio programs use OmniRig for CAT. My present VSPE configuration: VSPE config file with 2 Splitters. You can put the config file where you like, e.g Desktop or Quick Start bar. Usage in my case is as below. If you use my other config files below and VSPE, please adjust to your COM port numbers. Example CAT-manual (Yaesu FT-991, 2016-12-06), pdf: FT-991_CAT. Feel free to use this configuration help, and adjust the setup to your needs (call, name, QTH etc,, a lot).. Please edit in each macro file: update the file path to the other macro file path, so you can switch between them with a button click! There is also a config script that you can execute in FLDIGI to set up all configuration. It contains all my FLDIGI setup + macros, BUT then you must go through the settings and adjust to your data. Then you can use OmniRig Rig 1 for CAT when you have installed OmniRig. Your computer must have exact time, try using NetTime instead of Windows clock set. If you have a FT-991 or FT-991A, I recommend the free FTRestore utility to save and restore rig memories and menu values (donate to Chris though). Other hams' hints on FT-991 and digital modes: N1RWY + notes. and my article about FeldHell and contests in FLDIGI (pdf, in Swedish) in QTC 11/2018. 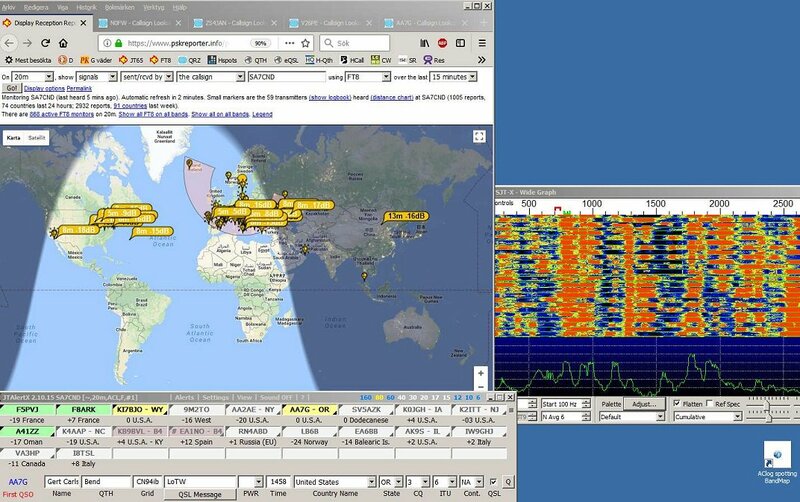 Below is the right or upper screen with PSKreporter in web browser (other tabs show QRZ lookups), JTAlert-X with yellow alerts, and WSJT-X Waterfall. As you may know, you can use WSJT-X for WSPR reporting, condition monitoring and antenna evaluation also. 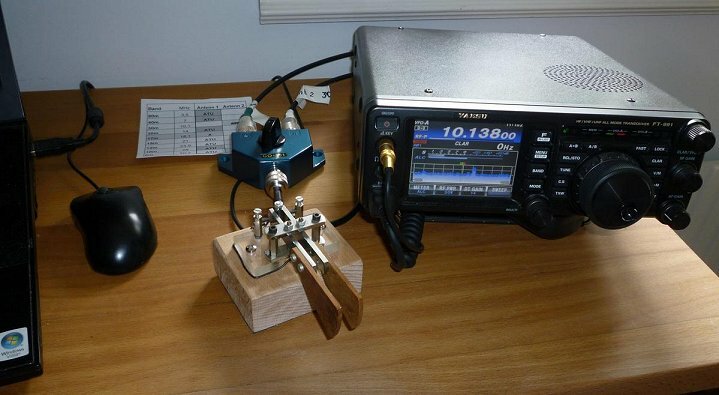 If you make a new WSJT-X Configuration, you can easily switch between FT8 and WSPR. Here is my article about WSPR in WSJT-X (pdf, in Swedish) that appeared in Swedish ham radio magazine QTC 7/2018. 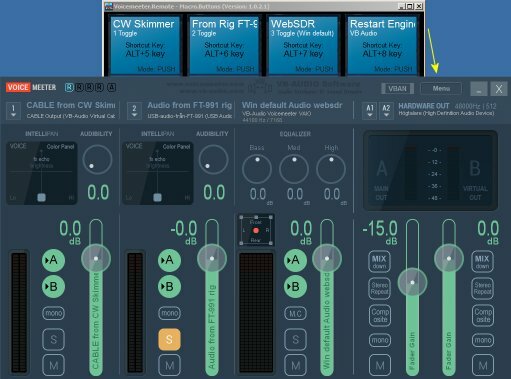 If you want to control what sound reaches your digital program e.g FLDIGI and speakers, I find Voicemeeter very useful. It lets you control what source that go to your digital program e.g when receiving audio signals from a WebSDR on the internet. You also need a VB-Cable that transfers audio digitally from one program to another. Note that these programs are Donationware, so please donate to VB-Audio. This is my voicemeeter "audio environment" and its settings. The buttons above control which left source that go to the right destination (speaker and FLDIGI). Check in Options that all audio use same sampling rate, 48 kHz. In FLDIGI you configure input device: "Voicemeeter Output (VB-Cable...VAIO)" in Configure - Audio - Devices - Capture, instead of "USB-audio-from-rig". Here are my Viocemeeter settings and macro defs (Save link as... to My Documents\Voicemeeter\). My article about WedSDR and FLDIGI (pdf, in Swedish) in Swedish ham radio magazine QTC 10/2018. I should also mention DJ0MY's program CATsync if you need to use a remote WebSDR receiver and you own transmitter/antenna regularly at home. CAT rig control (OmniRig) and Internet connection needed. Here is a demonstration of CATsync. I am experimenting with SDR in the form of a SDRPlay RSP1a, running it with HDSDR, a very capable SDR controller also good at CAT (transceiver control). You need a RSP1a ExtIO controller/API/driver that sits between the receiver (SDR controller) and the RSP1a.. If you want to use your SDR on same antenna as your transceiver, you need a safe switching arrangement to protect your SDR while transmitting. Some rigs have it built in and a separate RF SDR output. Otherwise you can dig into your rig and tap the RF signal after the TX/RX relay, on the RX input side. This is possible e.g with the FT-991. But this may not be enough protection: I have 2 back-to-back BAT43 Shottky diodes in parallell to cut RF level to SDR during TX. This keeps the level at SDR input at 1 dBm or less on all bands (except 6 m where my max TX is 30 W). Another alternative is a separate switching box such as the MFJ-1708SDR (various variants) T/R switch. Another use of my SDR is to run a CW Skimmer Server, controlled by Aggregator (ReverseBeaconNet RBN) to organize scanning and send spots to RBN. 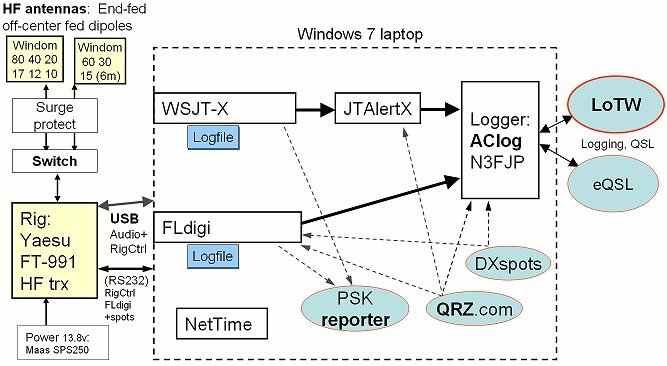 To report to PSKreporter also, you let a CW Reporter "listen" to Aggregator telnet spot server on port 7550. To control the SDR for skimming you also need a special driver SDRPlayIntf.dll so RSP1a gives you 192 kHz bandwidth and 3-band switching capability, thanks toSteve N2IC. Aggregator can even control which 3 bands you monitor over the day by switching CW Skimmer server's ini files and restart it. 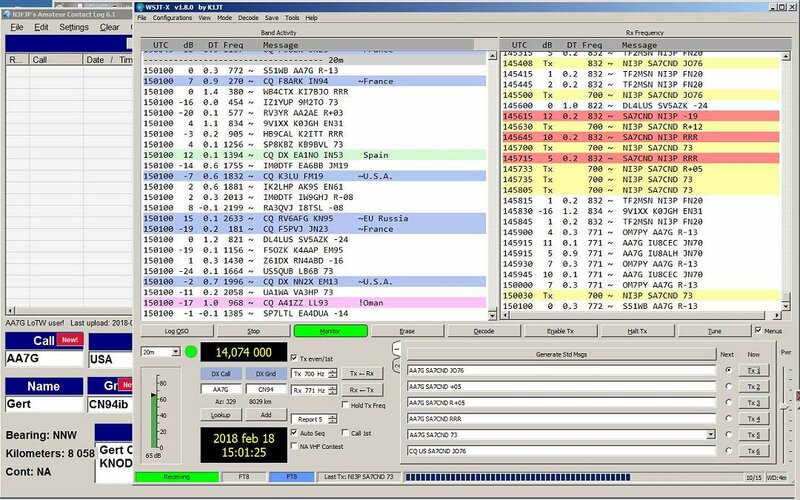 Here are my CW Skimmer ini files that also include the 60 m band (legal for Swedish hams from 2018-11-01). I use only Rate=2 192 kHz bandwidth, but the definitions in the files are valid to Rate=1 (96 kHz bandwidth also). 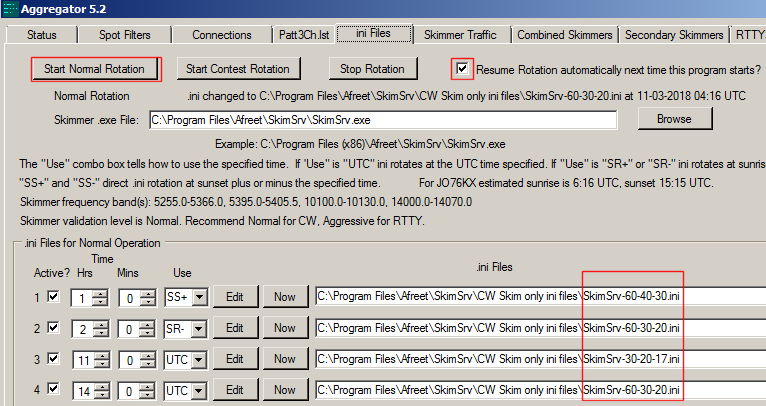 If you use the ExtIO_CWSL_Tee dll also then you can control the RSP1a from more than one program. The CWSL site has a good overview picture. I have been able to run both CW Skimmer and RTTY Skimmer at the same time this way, but the 2-core laptop cpu didn't have CPU enough, and got sluggish (and warm!). A lot of conditions apply to this; best advice here: N6TV (see "Quick Summary, for Windows" but adapt for RSP1a). It should be possible with HDSDR and ExtIO_CWSL.dll, but I have not been successful so far when CW Skimmer server runs. Here is a picture of the reception with RSP1a and RTTY Skimmer server from 24 hours of the WAE RTTY Contest 2018-11-11, where 1106 stations in 73 countries were reported to PSKreporter on 3 bands 80-40-20m. CW Practice texts from ARRL. Training CW 100 common English words: 18 wpm - 22 wpm (mp3 from lcwo.net). My CW training articles in Swedish ham radio magazine QTC: Bolder telegraphy + Develop your telegraphy (pdf, in Swedish).